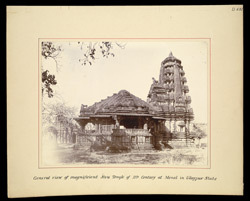 Photograph of a Shiva Temple at Menal, Rajasthan taken by an unknown photographer for the Archaeological Survey of India Collections: Northern Circle (North-Western Provinces and Oudh) in 1896-97. Menal is a complex of 50 Shiva temples near Bundi established in the Gupta period. The Gupta period (c. 320-647) was when the majority of northern India was under one dynasty and the style of the Hindu temple architecture coalesced and took its recognizable shape. While the earliest remains at Mehal date to the Gupta period, many of the temples were built later, in the 11th and 12th centuries. The tower over the sanctuary of this temple has tiers of miniature temple towers and the walls are decorated with panels that are carved with Hindu deities and Shiva figures. The hall in front of the sanctuary has projecting porches and is covered by a pyramidal roof.